Pioneer A-50DA review | What Hi-Fi? It’s a brave soul who enters the stereo amplifier market looking to make a lasting impression. At £700, the integrated Pioneer A-50DA has the build quality, features list and the heritage to make a bold stand. But it faces tough competition from the likes of Arcam, Cambridge Audio and Rega. 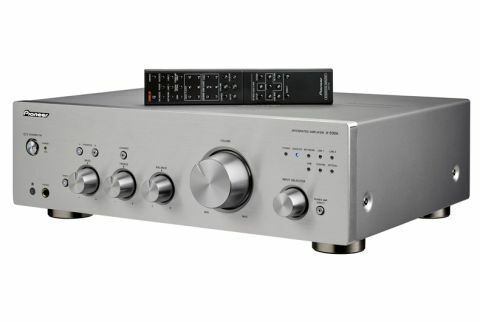 The A-50DA’s closest rivals are two Award-winners: the Cambridge CXA60 (£500) and the Arcam A19 (£595). The CXA60 is more affordable and the A19 doesn’t have an integrated DAC, so in effect, the Pioneer sits somewhere in between those two. The Pioneer is built like a brick, but the large, sturdy build exudes quality thanks to a shiny aluminium front panel and nicely finished controls. It’s a retro look, with knobs and dials clicking satisfyingly. We like the heavy feel of the input selector, and wish the volume and tonal controls were weighted in the same way. But it’s still a lovely product to use. If something lights up, it’s a brilliant blue, making it easy to see at a glance which input or feature is selected. You can control every aspect of the amplifier using the remote control, from selecting each input to switching between the two pairs of speaker outputs. The slim wand feels nice in hand, and the buttons are intuitive to use. Volume changes work in tandem with the rotary dial on the amp – you can see it turn instantly when buttons are pressed. Inside the Pioneer A-50DA is a class D amplifier which outputs a claimed 65W per channel into eight ohms. The digital side of things is handled by an asynchronous DAC that supports hi-res 32-bit/384kHz. Music at that resolution may be fairly limited in availability, but at least the option is there. It also supports all existing formats – FLAC, WAV, AIFF – in hi-res, plus double and quadruple DSD files. A USB type-B input lets you feed hi-res files from your laptop. There are four line-level inputs, digital optical and coaxial inputs, and an MM phono input for turntables, though high-output MC cartridges will work too. We prefer the analogue inputs, as the Pioneer’s DAC sounds rather thin and shallow compared with the line-level performance. You lose a lot of that open presentation via the digital inputs, too. There are two sets of speaker outputs, so you can drive speakers in another room or switch different pairs in the same room. There’s also the scope to use the Pioneer as a power amplifier – add it to your 5.1 home cinema system, and you can use the A-50DA to power your front speakers. The Pioneer has a wonderfully large-scale sound, with plenty of space for voices and instruments to soar. Yellow Light by Of Monsters And Men sounds sweet and breezy, with the Icelandic duo’s voices coming across clearly. Make sure you keep the ‘Direct’ button turned on to take advantage of that openness. The presentation is a touch forward, but it’s such a clean and even balance across frequencies that it doesn’t bother us much. The highs have plenty of space to breathe, with no spiky or bright edges. There’s ample weight underpinning the Pioneer’s sound, with the punchy notes of Marilyn Manson’s Killing Strangers coming across with weight and authority. We’d run the amplifier in overnight for the sound to settle, though. But even as it powers through a song with lots of muscle, it’s not quite as solid-sounding as the Arcam A19, which reveals more texture around those intense drum hits and moody basslines. The Pioneer tends to make everything sound nice and pleasant, whereas the Arcam and Cambridge are more capable of conveying the attitude and emotion of a song. What the A-50DA lacks is outright drive. Dynamic upheavals and lilting voices need an extra layer of subtlety to be fully expressive. We want a touch more sparkle to the tinkering keyboards in Yellow Light, and for the pauses in the song to be deeper and more dramatic. It’s a pleasing, full-bodied listen, but it doesn’t quite capture your attention the way the others do. The A-50DA is a great-looking piece of kit and nice to use. Its sound quality may not have beaten the current leaders in the field, with a lack of outright drive, subtlety and organisation stopping it from getting the full five stars. But that open soundstage and smooth performance are sure to find fans.